Ufone, for the first time in Pakistan, introduced Off-Net voice buckets for its customers. Now, Ufone postpaid customers with, Ufone Taikville Package, can buy off-net voice buckets for off-net calls. 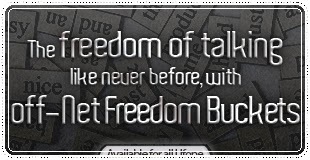 Initially the company has introduced two Talkville Off-Net Freedom Buckets. These are Talkville Off-Net Freedom Bucket 400 and Talkville Off-Net Freedom Bucket 1000. With this offer customers can get off-net minute for as low as Rs. 1+Tax per minute with Freedom Bucket-1000 and Rs. 1.25+Tax per minute with Freedom Bucket-400. With Ufone Talkville, with a one-time payment of just Rs. 500 per month on any Ufone Postpay package, customers get unlimited on-net (Ufone to Ufone) talk time.